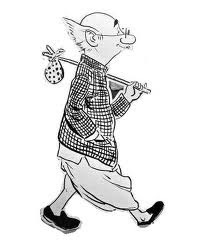 Thanks to R.K.Laxman for giving some much needed identity to the Mango Man (Aam Admi), through his caricature. His effortless endeavour over last five decades finally brought this not so important individual into various spectrum's of Politics, Policies, day-to-day hassles and in some bandwidth of latest technology as Twitter, Orkut . When Laxman started with his cartoons, he initially tried to put one individual of every state in his drawings to represent the whole India. According to him, he used to get complain mails if he somehow misses any representation of any state. That's where he brought about this figure of Aam Admi, in a torn attire, seeing the wrong happening everywhere but a mute spectator. The uniqueness of the Common man till date is, he never speaks. His wife is been seen quite vocal at times but the Aam Admi is still a mute spectator as he used to be some 50 years back. To honor Laxman and the Mango Man, Times Of India erected a bronze sculptor of this hapless chap in their office building which according to Guinness book is the largest of any comic character in the world. As shown in the movie "A Wednesday" and adequately being highlighted by Naserudhin Shah, the common man is the last man standing to face all the misdeeds of everyone else. Let it be as grievous as getting killed in bomb blasts to as minor as paying his hard earned money to the highway robber called the tax man. This is the individual who goes by the law, does his duty as a Son, Brother, Husband, Father, pays his taxes on time, does some odd community service, but end up getting oppressed every day. Somehow this common man never fits into any one's grand scheme of things. Nobody seems bothered about this fellow who could be the best citizen of the country. You comeback from office after a hard days work and switch on the lights, nothings gets illuminated. You scratch your head and give a call to the local fuse call office. Not to mention, you need to be a real lucky if someone picks up the call from that end. If at all one does then you would ask yourself why I spend time and money calling these guys. Frustrated you you open the tap, it sputters few drops and goes dry. This time you don't bother calling anyone, but feel like slapping yourself as hard as possible. Now as per Laxman's character you sit there and wait for your wife to speak or so to say, complain for you. Whom to blame thinks the Mango Man. Is it the Sarkar ? who are busy with Headly, Rana, Kasav, Didi, Mayawati, Raj Thakrey, All the Yadavs, Sashi Tharoor. Or is it the efficient administration installed by the Sarkar ? the babus who are busy with scams, buttering, doing their masters in crookism and buffonism. Ironically you find none to put your complain even. You sit again and start complaining and blaming yourself for just being a Common Man. You cry on your fate on why you are not a VIP or better a VVIP, so that all stuffs would have been on the press of a button. Suddenly you see a sea of changes on your wife's behavior. She is more happy if you bring home a kilo of Onion or 1/2 kilo of Udat Ki Daal, than presenting her a pearl set. She now believes in affirmation that a kilo of Sugar or Atta is costlier than Gold, Diamond or even the never seen Platinum. She no more nags you for the gold ornament that you had promised during your honeymoon some couple of decades back. Ask the Sarkar on when you can mark a difference between your neighborhood Kirana shop and the high flying jewellery shop down the street. There is a complete silence giving you the 'We care a damn if you don't find the difference you fool' impression. IPL is definitely high on priority for our Agriculture ministry. Now again you sit back for your wife to complain or wait for Laxman to put you in his next drawing the next day in TOI. If these are not enough, you are going for a walk on a lovely morning and a man completely covered with black attire comes to you and shoves a gun up your nose or any other openings he finds on your body and enquires about your income. Being allergic to gun, and more so when it is shoved up your nose, you divulge this personal information. Now he shoves the nozzle of the gun bit further up your nose in one hand while in the other takes out a calculator and does some mathematics quite unclear to you. Once finished he yells at you to give 30% or some X amount of you income without making any noise or complain. Due to the gun you oblige him and then he throws a paper at you to sign to acknowledge that you have given him your hard earned money. You think, hang on. Shouldn't it be the other way round. Before you could ask, the man with the gun has gone with your money.